Update on August 14, 2018: The submission deadline has been extended to September 14, 2018 from August 24, 2018. The fourth annual DSRIP Learning Symposium will take place February 11-13, 2019 in Saratoga Springs, NY, and the New York State Department of Health (NYS DOH) is currently seeking proposals for presentations and posters during the event. Presenting at the Symposium is an opportunity to share achievements, ideas and lessons with colleagues from across the State and to learn from the experiences of others. There is no limit on the number an organization can submit. The deadline to submit a proposal is August 24, 2018. Below please find additional information about the upcoming Symposium. The fourth annual NY DSRIP Learning Symposium will convene up to 800 leaders and stakeholders of the DSRIP program. 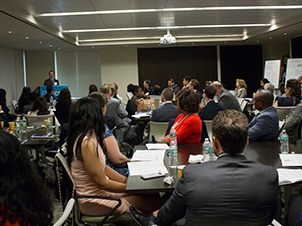 Participants will include the 25 PPS, community-based organizations, managed care organizations, and the NYS DOH administration, as well as consumer advocates, national health care reform experts, and other public health officials from within and beyond NY. There is no limit on the number of proposals for poster and/or presentations from a single organization. All proposals must be submitted online by August 24th. Proposals will be reviewed by a program committee and selections will be made to achieve the most compelling program for our diverse DSRIP community. There are a limited number of presentation and poster slots available, and as such, it is unlikely all proposals will be accepted. Please contact statewidesymposium@pcgus.com for any questions related to the Learning Symposium or the RFP.